Looking South From St. 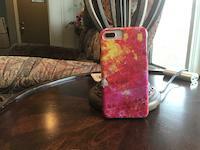 Basil iphone x case by Phyllis Tarlow. Protect your iPhone X with an impact-resistant, slim-profile, hard-shell case. The image is printed directly onto the case and wrapped around the edges for a beautiful presentation. Simply snap the case onto your iPhone X for instant protection and direct access to all of the phone's features! The view from the St. Basil Academy is absolutely breathtaking. I was able to paint there one day before the administration changed their minds about having artists paint on their property. What a shame that a view like this isn't open to the public to remind us of what a precious and magnificent world we live in.